teamfiedler.org - Former Athlete Profile - (Retired) Anne Fiedler. (nee - Fearnley). Home Profiles Former Athletes Former Athlete Profile - (Retired) Anne Fiedler. (nee - Fearnley). Anne was the foundation member of the team who was originally a long jumper, 100m sprinter, 100m hurdler and heptathlete. She was pursuaded to train more for 400m where she began to find improvements in all events including 400m hurdles. A late change in focus in Season 01/02 to 800m also found success. Her versatility was outstanding being able to run 100m in the low 12's whilst still being able to run 1500m in the mid 4.30's and the 800m in 2min04 and 400 hurdles in 60secs. She was Vice Captain of the Ringwood State League Premiership team in 94/95 and has been Captain every year thereafter until State League ceased in 05/06. Anne has always competed with the Ringwood Amateur Club joining them as a junior in 1988. 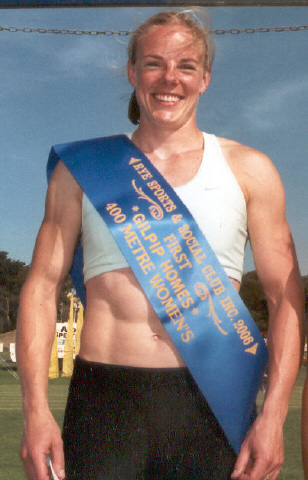 Anne retired from athletics at the end of 2005/2006. She has kept fit after missing a season and resumed less serious competition in 2007/2008. She ceased all competition at the end of the 2009 season. She is the owner of "Fearnley Massage Therapy" based at Genesis Gym in Ringwood. She is a serving firefighter of the Metropolitan Fire Brigade (MFB). She had her first child Emily on 23/03/2010. She is returning to running with a view to getting fit and strong again to resume work with the MFB. Pro debut : 93/94 at Kyneton in the 100m Womens. Anne at presentation of 2005/2006 Rye Womens 400m being her last win before temporary retirement. 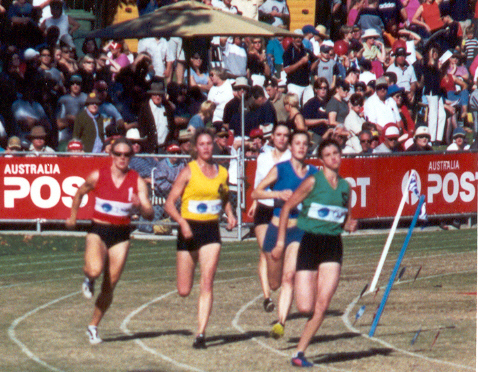 Anne (Red) in the final of the 2001 Stawell Womens 400m, shortly after winning the Open 400m. Anne at 2002/2003 Mt. Gambier Womens 550m presentation (1.20.42 off 14m). 1st Wangaratta Womens 400m, 1st Prahran Womens 800m, 1st Castlemaine Womens 400m, 1st Bendigo Womens 400m, 1st Ararat Womens 400m, 1st Heidelberg Womens 400m, 1st Moe Womens 400m. Voted as overall VRTA "Athlete of the Year". 1st Broadford Womens 120m, 1st Rye Womens 120m, 1st Rye Womens 400m. 3rd Prahran Womens 100m, 3rd Stawell Womens 100m. 2nd Bay Sheffield Womens 800m, 2nd Ringwood Womens 120m. 3rd Ocean Grove Open 120m Gift, 3rd Geelong Open 120m Gift, 3rd Keilor Womens 120m. 1st Fitzroy-Northcote Open 400m, 1st Bay Sheffield Womens 70m, 1st Rye Womens 120m. 2nd Bay Sheffield Womens 120m, 2nd VRTA Womens 100m, 2nd Maryborough Womens 400m. 3rd Strath Creek Womens 70m. Voted as "Athlete of Bay Sheffield Carnival". 2nd Rye Open 400m, 2nd Wangaratta Womens 400m. 3rd Wangaratta Open 400m, 3rd Stawell Womens 400m. Voted as "Bruce Walker Memorial Best Performance over 400m, 550m, 800m at Stawell". 1st and only female to win an Open event at Stawell. Voted as "Female Performance of the Year" - Stawell Open 400m win, and later same day 3rd in Stawell Womens 400m. Same performances at Stawell rewarded with inclusion in Stawell Hall of Fame top historic moments (40th moment). 1st Rye Open 800m, 1st Keilor Open 800m. 3rd Devonport Womens 400m Gift, 3rd Wangaratta Open 800m. Voted as "Female Individual Performance of Year" - Keilor Open 800m. 1st Moonee Valley Womens 300m, 1st Mt.Gambier Womens 550m, 1st Devonport Womens 400m Gift, 1st Burramine Womens 400m. 2nd Mt.Gambier Womens 120m, 2nd Bright Womens 120m, 2nd Camden Womens 400m, 2nd Stawell Open Frontmarkers 1600m. Voted as AAC "Female Athlete of Year". 3rd Mitchell Shire Open Frontmarkers 800m. 3rd Mitchell Shire Open Frontmarkers 800m, 3rd St.Bernards Open 800m. 1st Mt.Gambier Womens 400m, 1st Rye Womens 400m. 2nd VRTA Womens 400m, 2nd Dandenong Womens 300m, 2nd Bendigo Womens 120m. Resumed competition but nil placings.